David S. North is a fellow at the Center for Immigration Studies. By now most of us realize that the government handled the $700 billion bailout of the big banks badly. The money went out in a whoosh to the Wall Street outfits that had created the crisis, but without the needed regulatory changes to prevent its repetition. Is Congress about to make a parallel mistake about the illegal alien population and give that group a blanket amnesty like the one it lavished on the (much smaller group of) bankers, without giving a thought to the inevitable impacts of such an action? With that dubious prospect on the horizon, it is a good time to take a careful look at the dysfunctional inner workings of the last major bailout of America’s illegal alien population, the alien legalization program that Congress created with the passage of the Immigration Reform and Control Act of 1986 (IRCA). It is well known that some 2.7 million aliens secured legal status — many of them fraudulently — in that program, but there has been little discussion of the strange inner machinations that caused so much of the problem. The agency running the program, the old Immigration and Naturalization Service (INS), far from being the tough law-enforcement agency the immigrants’ advocates feared, turned out to be a typical governmental agency with a strong case of client-itis, one that usually said “yes” to its applicants. Operating without many useful precedents, INS created a new and questionable decision-making process that severely hampered the detection of fraud. A great deal of money intended for the legalization program was diverted to other government programs. The Political Background. IRCA was an omnibus immigration law, an attempt to form a grand bargain that would take care of many immigration policy disputes. Part of it was the introduction of “employer sanctions,” saying that it would be illegal, in the future, for employers to hire illegal aliens; the other part was the legalization package. The promise was that sanctions would eliminate the lure of jobs in the U.S. economy and the legalization package would put several important groups of illegal aliens on the path to citizenship, thus shrinking the size of both the current and future illegal populations. There were extensive hearings and much public discussion of the various issues. The grand bargain was supported by President Reagan and his Attorney General, Ed Meese, as well as by the leaders of the GOP-controlled Senate and the leaders of the Democrat-controlled House. The chairman and ranking member of the Senate immigration subcommittee, Sens. Alan Simpson (R-Wyo.) and Ted Kennedy (D-Mass. ), had devoted considerable time and energy to its drafting, as had the House subcommittee chairman, Rep. Romano Mazzoli (D-Ky.). House Judiciary Committee Chairman Peter Rodino (D-N.J.) was similarly supportive. In short, legalization came into being with a considerable head of steam. It was only later that it became apparent that no serious effort would be made to either enforce employer sanctions or to create a national ID card that would make it easy for employers to identify legal, as opposed to illegal, immigrants. IRCA’s Terms. The new statute (Public Law 99-603) was very complicated and was fully 100 pages long. It provided for four separate alien legalization programs, two of them quite narrow and never subject to much controversy,5 and two much broader programs. Both the SAW and the pre-1982 programs created a new, and passing, legal status for those approved. They became legal Temporary Resident Aliens (TRAs), a step toward green card status. While they were in this category their access to government-funded programs was limited, and they could not use the status to bring more immigrants into the country; they were, however, in legal status and could cross the border through the ports of entry. The paragraphs above touch only lightly on the extreme complexity of the program; there was, for instance, an ongoing controversy about a provision of the bill that required continuous residence for applicants except for “brief and casual” returns to the home country. The phrase was subject to continuing controversy, pressure from the immigration bar for a loose regulation, rounds of rule changes by INS, and more rounds of court decisions, with the result that the allowed periods of absence grew as the program progressed, and thus the number of eligible aliens continued to expand. It was only natural — but rarely discussed — that the INS would act in pretty much the same way in the legalization program. In retrospect, I must say that it certainly did, though I did not consider that a factor at the time. Later in my work with immigration policy I remember a conversation with a former U.S. consul general in Manila; he made a strong point to me about how much more work is created for an individual consular official when he or she rejects a visa application, as opposed to approving one. There are reports to write, appeals to cope with, letters from local politicians criticizing the decision, and the like. But with an approval, except for the odd one that goes wrong, there is no further work. Institutionally, it works the same way. The Mood Inside INS as Amnesty Approached. As I recall, and this is quite subjective, the mood within INS, which I knew pretty well at the time, was interesting. On one hand the agency (largely a law-enforcement shop) had never run a massive short-term benefit program in the past; its executives wanted to tackle their new duties energetically, and their prime worry was that the eligible population might be frightened away by the long-standing law-enforcement image. On the other, the leadership knew that there would be fraud, but its detection did not appear to be a truly major concern as the program began. There was a lot of enthusiasm for the program, at least initially, at the staff level. We kept running into people who had been, for instance, detention officers, who now were running local legalization programs and pleased as punch to be, perhaps briefly, wearing white hats. External Pressures All One Way. Another element in the IRCA setting was the imbalance of forces playing on the program once it got underway. Neither the White House nor the Justice Department nor the Congress paid much attention to the program’s operations, or its evolving regulations. The restrictionists were largely quiet,9 but the pro-broad-immigration policy people were extremely active. There was extensive lobbying regarding the necessarily complex regulations at the national level, day-to-day pressure from like-minded organizations at the field office level, and a series of lawsuits, most of which were decided on a pro-immigrant-rights basis by the federal courts. The Structure. As the leaders of INS designed the organizational structure for the forthcoming legalization program, they not only worried about the levels of participation by the resident illegals, they also bore in mind a pattern of INS decision-making that they did not want to continue. The pattern was in the naturalization program, a decades-old responsibility of the agency.11 Adjudicators in the district offices had made decisions on the applications, following interviews, without much Central Office (CO) review, and the approval rates (in the first half of 1985) ranged from 44.1 percent in the Harlingen Office (on the U.S.-Mexico border) to 88.4 percent for the much smaller volume in the Anchorage Office.12 The CO wanted to obtain a much more consistent set of decisions in the new legalization program. In addition, the CO sought more centralized control of the whole process, and wanted, thus, to diminish the independence of the 34 district directors, all veteran civil servants who had become used to running their own operations. INS had at the time a superstructure of four regional offices but the real power in the field lay with the district directors. Further, there was a governmental precedent for handling millions of paper-based decisions each year, and that was within the Internal Revenue Service (IRS). Some key players in the CO visited several IRS processing facilities to see how they handled the annual flood of paper from the nation’s taxpayers. Finally, there was a precedent within INS for “remoting” some decision-making on fairly simple issues, such as the extension of a student visa.13 The CO noticed that some of the district office adjudicators had much more work than they could handle while, simultaneously, there were times in the middle of the night at the border crossings when officers there had little to do. So some of the decisions that could be made on the basis of paperwork alone were shipped or “remoted” from the district offices to the ports of entry. With all these considerations in mind, CO devised a brand-new decision-making structure for the brand-new program. In order to both decrease traffic in the existing district offices, and to create a series of legalization-only offices with no law-enforcement overtones, the CO opened a string of 107 legalization offices. They were, organizationally, within the ambit of the district directors, but physically (and psychologically) they were separate. These offices were staffed with some current INS people, some INS retirees (often acting as supervisors), and many others, often with experience in other benefit-granting programs. Unlike the interviews with naturalization applicants, where decisions were made on the spot, these legalization office interviews were totally non-confrontational. In many cases the interviewer (unknown to the applicant) wrote on the form that the application should be denied and/or that fraud was suspected. Missed Opportunities to Detect Fraud. There were many missed opportunities to detect fraud, particularly in the SAW program where applicants vowed that they had worked in agriculture for at least 90 days. There was, for instance, a conscientious first-line interviewer who knew something about the rural life and who faced many SAW applicants who did not. She developed a loose-leaf notebook with no text. It consisted of pictures of, and dried leaves from, the kinds of crops that were grown in her area. If someone said that they had picked strawberries, she asked them to show her the strawberry plants in the book; if they could not properly identify them she recommended a denial. I remember asking the Deputy Assistant Commissioner in charge of the SAW program why the CO had not instructed field offices to replicate what she had done, and he said, in effect, there was no political will for spending time and energy on such things when the courts were constantly ruling against INS. Similarly, there was a gold mine of computerized information in the files of the California Department of Employment Security on wages paid to farm workers by growers; it related to the state’s temporary disability insurance program. There was no effort made by INS to verify claims by California SAWs that they had worked for a specific employer by checking the state’s tax records for that employer. Susan Gonzalez Baker, in her highly useful book on the IRCA program,16 describes a similar situation: an assertive SAW fraud-detection program that was developed by the Houston Legalization Office, but not adopted nationally. The Houston office had conducted intensive interviews with 2,000 SAW applicants and gave recommendations for approvals to no more than 300 of them. How to Handle Case-by-Case Decisions. Let me digress for a moment. In the years since IRCA I had two other opportunities to examine, in some detail, how government agencies engage in case-by-case decision-making, and how they deliver the decisions to the person or persons involved. In the mid 1990s I was asked by INS to conduct a study of the asylum decision-making process, for the internal use of that agency. Asylum seekers have much in common with legalization applicants — both are (usually) in this country illegally, and both want legal status. In the case of the asylum seekers they might qualify for refugee status were they in their home country, or nearby, but the seekers had managed to make their way to the United States. The asylum seeker was, after some preliminaries, interviewed by an asylum officer. The officer asked a bank of questions and the interview was concluded. The officer later reviewed what was learned in the interview, checked out the conditions in the country of origin, made a recommendation, and passed it on to a supervisor, who usually accepted the recommendation. Once all that was done the seeker was called back into the office and was told the status of the case by someone other than the interviewing officer. The asylum decision-maker, much like the first-line legalization interviewer, did not have to tell the alien face-to-face what the government’s decision was. About the same time, I was appointed by the governing body in Arlington County, Va., to be chair of the local board of tax appeals.17 I served for over 10 years. There were five of us on the board and we handled real estate assessment appeals from home owners and owners of commercial properties. It was a part-time activity involving some 100-150 appeals a year, from owners of modest ($250,000) houses to those who owned or represented corporations with $100 million structures. We held a hearing on each appeal, discussed what we had heard, and made a decision with the appellant in front of us. Usually we dismissed the appeal; sometimes we voted a reduction, but rarely as much as the appellant wanted. Although it was in the grand Wilsonian tradition — open covenants, openly arrived at — the five of us often faced some pretty hostile reactions, more likely from individual homeowners than from the professionals speaking for corporate interests. From time to time I reached out to other Virginia boards of tax appeals to see how they handled their programs. (There was then no organized communication among the tax appeal boards.) Many of them had decided, for understandable reasons, to listen to the arguments at public sessions and then retreat into private sessions to make the decisions, which were then transmitted by letter. All of these systems — those of IRCA legalization, the INS asylum program, and the non-Arlingtonian tax appeals boards — take a non-confrontational approach to delivering decisions to the appellants; it is likely that DHS will take a similar approach if another legalization program is mandated. If there is another legalization program, which I do not advocate, the following scenario should have a chance to play out. If the applicant seems to have a weak or apparently fraudulent application, the interviewer would then tell the applicant that this was the case, and give the applicant two choices: either proceed with the application, and possibly run into trouble if it is rejected, or withdraw it. If the latter occurs the applicant is told that his or her name and address will not be forwarded to the enforcement people and the fee will be refunded (or perhaps not collected in the first place). The Department of Homeland Security would, however, retain a one-page cover sheet (with a photo and a thumbprint) as a record of the application’s withdrawal. All applications filed would then be matched against the file of those that had been previously withdrawn. The applicants in the IRCA legalization program never encountered such a situation with the result that, as we will show shortly, a large number of what must have been fraudulent applications were approved. Another Model — Social Security’s Disability Retirement Decisions. There is another government decision-making system that handles millions of benefit decisions each year on a paper-only basis: the Social Security Administration’s (SSA) disability determinations process. A favorable decision gives the disabled worker a retirement-like pension years before the normal retirement age. Each favorable decision is thus both valuable to the worker and expensive to the government. The disability determinations are based on applications and medical records sent to a central location in each state and territory; the decisions are not based on interviews. The system is not without its critics, who have long thought it both too slow in responding to applications and not generous enough.21 It is a system, however, unlike IRCA, that in most years says “no” to more than 60 percent of its applicants, and says “yes” to less than 40 percent of them. Perhaps the difference between the high rate of rejections in the disability system, and the remarkably low rate of rejections in the IRCA legalization — 12 percent — relates partially to the perceived costs of the two different decisions. While both programs have strict legal definitions of eligibility and these are important in both settings, in SSA the management and staff are aware of both the benefits to the individual and the costs to society. I have a feeling that there was no particular sense in INS that a grant of legal status in the IRCA program represented any cost to society. Congress had decided that the costs of the legalization program were to be borne by the applicants; the successful ones, after all, would receive a major, life-long benefit. INS decided before the program started that the basic fee would be $185 per application. The fees collected in the pre-1982 program and the expenses of that program, roughly $400 million, were in approximate balance with other. But there was no similar balance in the SAW program, where fully three-quarters of the $240 million collected in that program — all from the applicants — was diverted to other government programs. One nicely documented example of such a transfer was reported by Interpreter Releases, the immigration bar’s scholarly trade paper. An assistant INS commissioner announced that $50 million in what he termed excess SAW fees were going to be used to buy INS a whole new generation of computers.23 When I reported, during the Ford-supported research, that this money could have been, and should have been, used to identify fraudulent SAW applicants, that assistant commissioner (who will remain nameless) literally screamed at me; I had apparently touched a raw nerve. In short, one of the reasons why there was so much fraud in the SAW program was because INS siphoned off $180 million or so away from fraud detection. Many Legalizations. 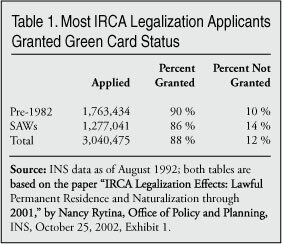 The principal, immediate result of the IRCA legalization program was the addition of nearly 2.7 million to the population of those legally present in the United States, as Table 1 indicates. About 1.6 million of these came through the pre-1982 program and the balance, 1.1 million, were from the SAW program. There were also a few thousand who had benefitted from the two minor legalization programs, those for long-term illegals and for some of the Cuban-Haitian entrants. A couple of years after the end of the filing period, INS funded a survey of those who had been legalized through the pre-1982 part of the program. The contractor, Westat, had some troubles reaching the population of interest — and would have had even more trouble had the SAWs been included — but it managed to reach a pretty good sample of 6,193 of them.24 Only beneficiaries over the age of 18 were interviewed. The study showed that the population was primarily from Mexico (70 percent), a percentage that would be considerably higher if the SAWs were included. The pre-1982 beneficiaries were 58 percent male, had about seven years of education on average, and two-thirds were residents of the border states. California was the residence of 55 percent of them, and Texas 18 percent. Illinois and New York each had 7 percent of the population. Much Inaction on Much Fraud. The striking thing about Table 1 to one who has been in close touch with the program is the rejection rate for the two sub-populations, 10 percent of the pre-1982 applicants were rejected, but only 14 percent of the SAW applicants did not get green cards. The low rate of SAW rejections is jarring whether one looks at the internal dynamics of the program or at population figures or at the mountains of anecdotal evidence. As to the program dynamics, bear in mind not only that the time in the United States to be claimed, and hopefully documented, was much less in SAW than in the other program, and that the rewards were marginally better in the SAW program, but there was also a period of nearly seven months between the close of the pre-1982 program and the close of the SAW program. Whatever your eligibility, the only program you could apply to during these months was that for SAWs. These factors, one would suppose, would tend to facilitate more fraud in the SAW program than in the other. As we noted in our Ford report,28 and as many others did as well,29 the number of SAW applicants in California (699,100) was at least twice as high as any other governmental measure of the total farm labor force in that state — even assuming, as one should not, that every bit of farm labor in the state was performed by SAW applicants and that legally resident persons did not pick a single tomato nor cut a single lemon. This statistic would suggest that at least half of the California SAW applications were fraudulent. QDEs were “qualified designated entities” (another lovely use of the language), community organizations funded by INS to help applicants apply for the legalization program. Ethnic organizations in the Southwest and local units of the various refugee-serving agencies often secured the (rather modest) QDE funding. A Muffed Public Health Opportunity. There are public health interventions at some set points in people’s lives, such as the requirement of vaccinations for all entering students by many public schools. Similarly, ever since the days of Ellis Island (which turned away immigrants with what were thought to be dangerous diseases) there have been public health aspects of the immigration process. During IRCA’s legalization there was a required, once-over-lightly medical interview and blood test for, among other things, AIDS. I had suggested in testimony before the Senate immigration subcommittee that those seeking legalization should also be required to have the same set of vaccinations demanded of school children. This was watered down to a requirement that the medical interview should include questions on vaccinations. In the years since, the Public Health Service has strengthened its hand and arriving immigrants are now required to have vaccinations. So while some IRCA legalization applicants learned that they had TB or AIDS — a benefit to them and to the wider public — an opportunity to give vaccinations to three million people — people with minimal health care opportunities — was lost. The Big Picture. As with the bailout of the bankers, where a small minority secured major benefits at the expense of the rest of us, the benefits from the legalization program are largely private, while the long-term costs are borne by the larger society. We cannot, in this paper, do more than touch on the long-term fiscal and demographic impacts on society as a whole of the changed legal status of these 2.7 million people. Minor Labor Market Advances. Another factor clouding the cost-benefits analyses of the results of the IRCA legalization program are the writings of statistics-shaping optimists, presumably good people who may not know that their cheerful outlook colors their findings. A series of analyses based on this sample of unauthorized immigrants revealed a high level of labor force participation with a pattern of moderate upward occupational mobility over time. By 1992, over 45 percent of men and 27 percent of women had attained occupational status better than the bottom third of all persons in the labor market. It sounds good until you do the math. For simplicity’s sake let’s assume that there were as many women as men in the sample. Then let’s add 45 percent to 27 percent and divide by half, giving us 36 percent — that’s the group that is above the bottom third. Now let’s subtract 36 percent from 100 percent and we have 64 percent who are, by definition, in the bottom third. So 10 years after they arrived this sample of the legalized population is still about twice as likely to be in the bottom third of the labor market as Americans generally. We should not be surprised, even though they are here legally, now, because statistics show that, on average, they are a lightly-educated work force with limited to very limited English. And were the SAWs to be included in the survey, the results would have been even more dismal. While the legal benefits of regularized status can, appropriately, be contrasted as black and white, the labor market differences, 10 years later, appear to be a comparison between very, very dark gray and very dark gray — but some commentators do not have gray on their palettes. Below-Average Interest in Citizenship. Speaking of gray, that is a good color for depicting the naturalization rates of the newly legalized. While I have not seen any governmental analysis — it may exist — of the extent to which the IRCA legalization beneficiaries have made use of their new status to secure immigration-expanding visas for their relatives, INS, before it was consumed by the DHS, did provide useful information on another topic, naturalization. 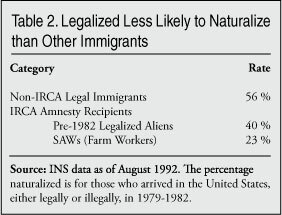 In a study of aliens who arrived in the United States in the years 1979-1982, legally or illegally, INS checked on the differential patterns among three groups for subsequently securing citizenship — the normal flow of legal immigrants, the recipients of the pre-1982 amnesty, and the SAWs. I am assuming that all had an equal legal right to take the citizenship tests, but, as Table 2 shows, the non-IRCAs were more likely to do so than the people going through the legalization program. And within the IRCA program, the pre-1982s were almost twice as likely to go through the process as the SAWs. The United States should not have another legalization program. We have proved that amnesties simply beget more illegals, and they, in turn, beget new and more vigorous pleas for another amnesty. We know, or should know, that more people with limited skills and limited rights in the labor market can only lead to still greater discrepancies between the rich and the poor. Further, as a nation, we seem to be incapable of creating an adequate infrastructure for those who are already living here — why strain it further? If there is to be a legalization program, there should be no special program for farm workers. If there were to be one, it would certainly be designed to maximize the numbers of approved applications and to minimize fraud control. If there is to be a general amnesty, it should be narrow in scope, and it should come with a decision-making system focused on permitting legalization only for those who meet the qualifications. It should put heavy emphasis on the initial interview, and make sure that the burden of proof is on the applicant throughout the process, as it was not during part of the SAW program. Similarly, there should be a readily available opportunity for shaky applicants to withdraw and to get their money back if fees again fund the program. The funding of such a program should be arranged to fully support fraud detection, not only using all the fees collected for that program, but tax funds as well, if need be. There never should be a financial incentive to the managing agency to tolerate fraud, as there was in the SAW program. Within the U.S. bankruptcy court system, a Justice Department entity, there is an institutional arrangement that might be copied if Congress makes the mistake of creating another legalization program. It is based on the premise that the narrow resolution of competing private interests (creditor vs. debtor) does not always serve the public interest. Separate from the bankruptcy courts there is the Office of the U.S. Trustee, another Justice Department entity. It plays a continuing role as friend of the court, observes what is happening, and when the public interest appears to be neglected, it intervenes with recommendations to individual judges in individual cases. It would be helpful if a disinterested, well-funded, public body could play the same role should there be a legalization program, intervening on behalf of public policy considerations when the decision-making system focuses almost solely, as it did during IRCA, on the claimed individual rights of applicants. Further, the statute setting up any legalization program should make it clear that public-interest bodies, just as individual aliens, have a legal standing to argue their point of view. I think IRCA was silent on this point. 1 The late Administrative Conference of the United States, a small, Executive Branch agency that focused its attention on administrative decision-making within the federal government. 2 We wrote two reports for Ford: David S. North and Anna Mary Portz, Through the Maze: An Interim Report on the Alien Legalization Program, TransCentury Development Associates, Washington, DC, March 1988 (hereafter cited as N-P, Maze); and North and Portz, The U.S. Alien Legalization Program, TransCentury, Development Associates, Washington, DC, June 1989 (hereafter N-P, Legalization); for the Administrative Conference, we wrote North and Portz, Decision Factories: The Role of the Regional Processing Facilities in the Alien Legalization Program, Administrative Conference of the United States, March 1989. Ms. Portz, an honored colleague at the time, was not involved in the writing of this Backgrounder and would not necessarily agree with some of this text. 3 Steven A. Camarota “Amnesty Under HagelMartinez: An Estimate of How Many Will Legalize If S. 2611 Becomes Law,” Center for Immigration Studies, June 2006, http://www.cis.org/HagelMartinez-S2611-Amnesty. 4 See, for instance, David North, “The Who’s Who of Immigration Policy Making,” Center for Immigration Studies, September 2009, http://www.cis.org/north/whoswho1. 5 Neither of these lesser programs drew more than a few thousand applicants and neither needs much discussion. One gave legal status to really long-term illegals, those in the nation who could document their presence since January 1, 1972; this was the Registry program. The other gave permanent resident alien status to some narrowly defined Cuban-Haitian entrants (who had previously had a tentative legal status, and who were known to INS — making it an easy little program to administer). 6 Nancy Rytina, “IRCA Legalization Effects: Lawful Permanent Residence and Naturalization through 2001,” Office of Policy and Planning, Statistics Division, INS, October 2002, Exhibit 1. 8 Susan Gonzalez Baker, The Cautious Welcome: The Legalization Programs of the Immigration Reform and Control Act, The RAND Corporation and The Urban Institute, 1990, pp. 90-93; also N-P Maze, op. cit., p.37. 9 The Federation of Americans for Immigration Reform (FAIR) filed a lawsuit seeking to make a provision of the SAW program more restrictive by narrowing the list of crops that created SAW qualifications, and was told by the judge that it had no standing in the matter. In contrast, individual aliens seeking to broaden eligibility were judged routinely to have standing for their suits. The decision against FAIR (Northwest Forest Workers v. Lyng, 688 F.Supp. 1 (D.D.C. 1988)) discouraged the restrictionists from further court filings, I was told by a FAIR lawyer at the time. Also, see Baker op. cit., p. 93. 10 Baker op. cit., pp. 92-93; and N-P op. cit., pp. 61-66. 11 As it happens, the Ford Foundation had funded a study of mine on the decision-making process in this program in 1985; see David S. North, The Long Gray Welcome: A Study of the American Naturalization Program, NALEO Education Fund, 1985. NALEO stands for the National Association of Latino Elected and Appointed Officials, which was partially funded by Ford at that time. 14 Baker, op. cit., pp. 95-98. 15 For the 1989 data see N-P, Legalization, op. cit., Exhibit 5; the close of the program data is calculated from Rytina, op. cit., Exhibit 1. 16 Baker, op. cit., pp. 141-145. 17 The awkward formal title for these entities is the Board of Equalization of Real Estate Assessments. 18 Baker, op. cit., pp. 141-145. 19 In the first half of FY 1985, these were the dispositions of the naturalization applications nationwide: approvals 71.8 percent, denials 2.8 percent, and non-approvals 25.3 percent. North, Long Gray Welcome, op. cit., Exhibit 13. 20 These data were calculated from SSA’s Annual Statistical Supplement, 2008, pp. 6.21-6.24, http://www.ssa.gov/policy/docs/statcomps/supplement/2008/supplement08.p…. 21 See, for instance Martha Derthick, Agency Under Stress: The Social Security Administration in American Government, The Brookings Institution, 1990. 22 For more on this see N-P, Legalization, op. cit., pp.89-96. 23 “INS Advises on SAW Fraud,” Interpreter Releases, vol. 65, no. 37, September 28, 1988, p. 983. 24 U.S. Department of Justice, Immigration and Naturalization Service, Immigration Reform and Control Act: Report on the Legalized Alien Population, John A. Bjerke, Project Director, March 1992. I was a consultant to Westat on the project, but neither designed it nor wrote the final report. 26 N-P, Legalization, op. cit., p. 80. 27 The 55 percent figure is calculated from INS data shown in Baker, op. cit., p. 165. 28 N-P, Legalization, op. cit., pp. 83-87. 30 Camarota, op. cit., p. 2. 31 N-P, Legalization, op. cit., pp. 78-87. 32 Baker, op. cit., pp. 138-145. 33 N-P, Legalization, op. cit., pp 82-83. 34 Mary G. Powers, et al., “IRCA: Lessons of the Last U.S. Legalization Program”, Migration Policy Institute, July 2004, http://www.migrationinformation.org/Usfocus/display.cfm?ID=233. 35 Rytina, op. cit., Exhibit 4b. A needless complication within the SAW program established a sub-program for those workers with 270 days of farm work, as opposed to the subprogram for the much more numerous group that claimed 90 days.